From the Ozzy Osbourne collection by Vandor. Ozzy Osbourne 25 Ounce Stainless Steel Water Bottle. This Item is in stock and ready to ship. 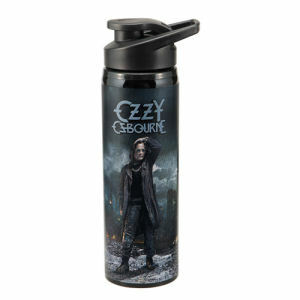 You should not postpone your purchase and miss out on adding Ozzy Osbourne 25 Ounce Stainless Steel Water Bottle to your Ozzy Osbourne collection! From the Ozzy Osbourne collection by Vandor. Ozzy Osbourne 25 Ounce Stainless Steel Water Bottle. Featuring a new flip-top design, water bottles are eco-friendly, non-toxic, reusable and recyclable. Hand wash recommended. Vandor Ozzy Osbourne Water Bottles shipping from Canada. No Surprise Border fees or Customs!